Working in a digital agency, sometimes you don’t realise how your days/weeks pass-by and it’s more so when you are managing your own business. A couple of months into the regular regime, I knew that my soul needed a break! That’s when we started planning for our next vacation. Being in Delhi, North has always been accessible so we wanted to explore a bit of South India. Having visited Kerala in 2011, we were looking to visit a new destination. 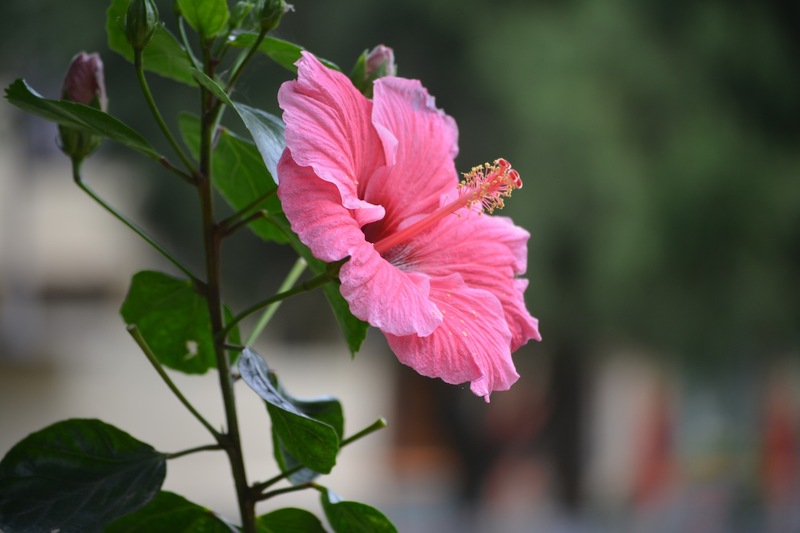 After a bit of looking-up, the thought of going to Coorg and Mysore came to our minds. Number of Days: We holidayed for 4N/5Days. Spent 3 nights in Kushalnagar near Coorg and 1N in Mysore. Flight: We booked our flight tickets with Indigo Airlines a couple of months in advance. Where to Stay? (Hotel or Home-stay) We opted for the Eco Habitat home-stay at Kushalnagar and the experience was brilliant. Post our vacations, we have realised that nothing can beat the experience of a home-stay if chosen correctly. In Mysore, we stayed at The Ginger Hotel and got a good deal from goibibo.com. What to do? 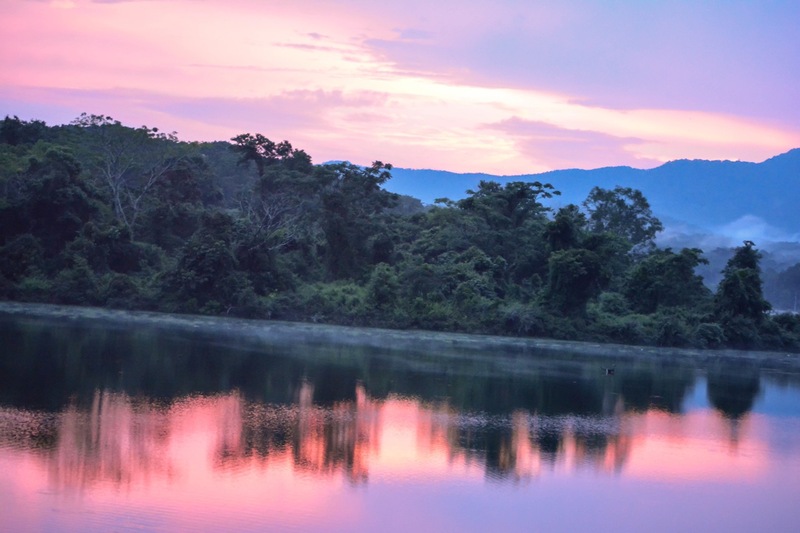 Coorg and nearby areas have plenty of options. It depends on what you are comfortable with. There are places for trekking, rafting, river sight-seeing, you could see the waterfalls and of-course the usual ones such as visit the temples, heritage sites etc. How to go? This isn’t a million dollar question as you would be traveling via cab if you’re like me and are coming all the way from Delhi. I evaluated a couple of cab/taxi services and finalised Taxiforsure.com. What an experience it was & the driver was a rockstar. He was very helpful despite the language barrier and went a long way in assisting us and clicked a lot of our trip pictures. 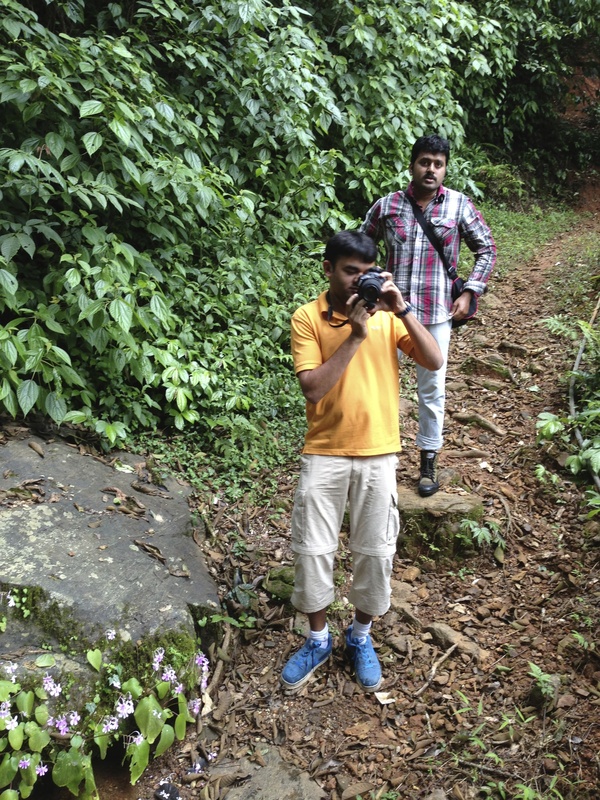 Here is a photo-story of what we did & the places we visited during our stay in Kushalnagar/Coorg. The pics have been taking using an iPhone 5 and Nikon DSLR camera. That’s why you would see a difference in the quality/type of images. 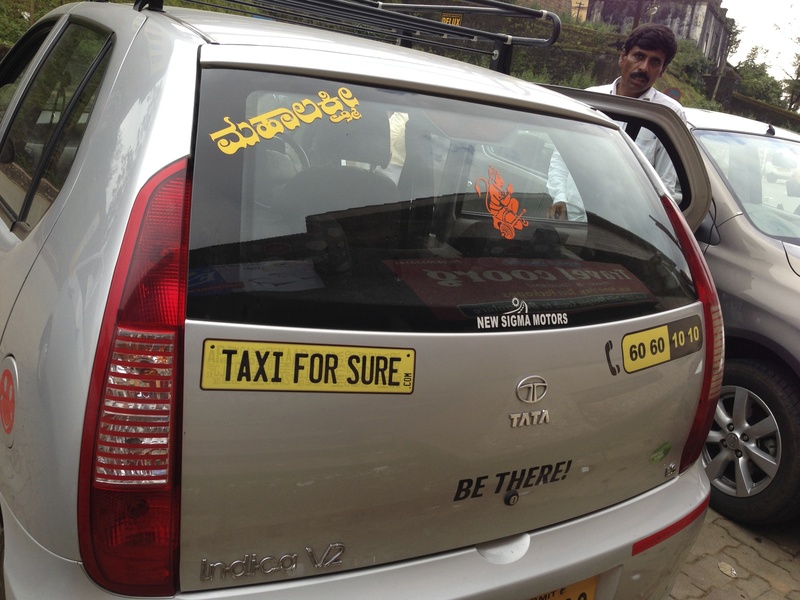 The taxi from taxiforsure.com was right on time and we got an instant buzz the moment we touched down at the Bengaluru airport. 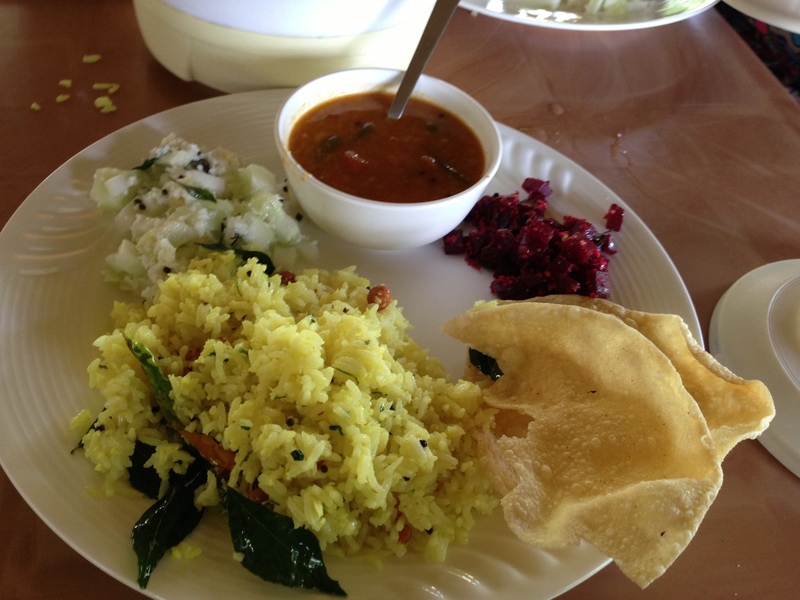 Stop over for lunch with the traditional Kairali thali at the Kamat. 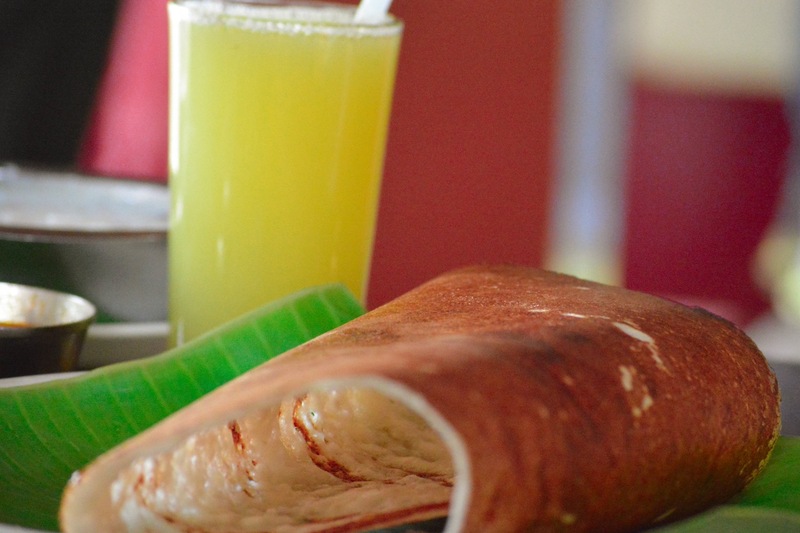 Since I was just getting into the journey groove, I started with a plain dosa and mausami juice. The restaurant is just before you touch Mysore, enroute Coorg. The charm, the aura and the surroundings of a home-stay are really very special. 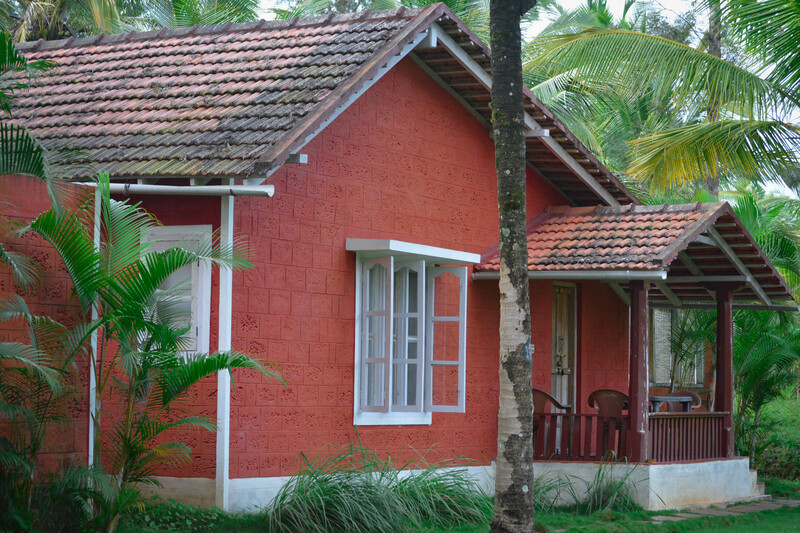 Coorg has plenty of options for home-stays. We stayed at Eco Habitat in Kushalnagar which is slightly off Coorg but a fantastic property and well connected. 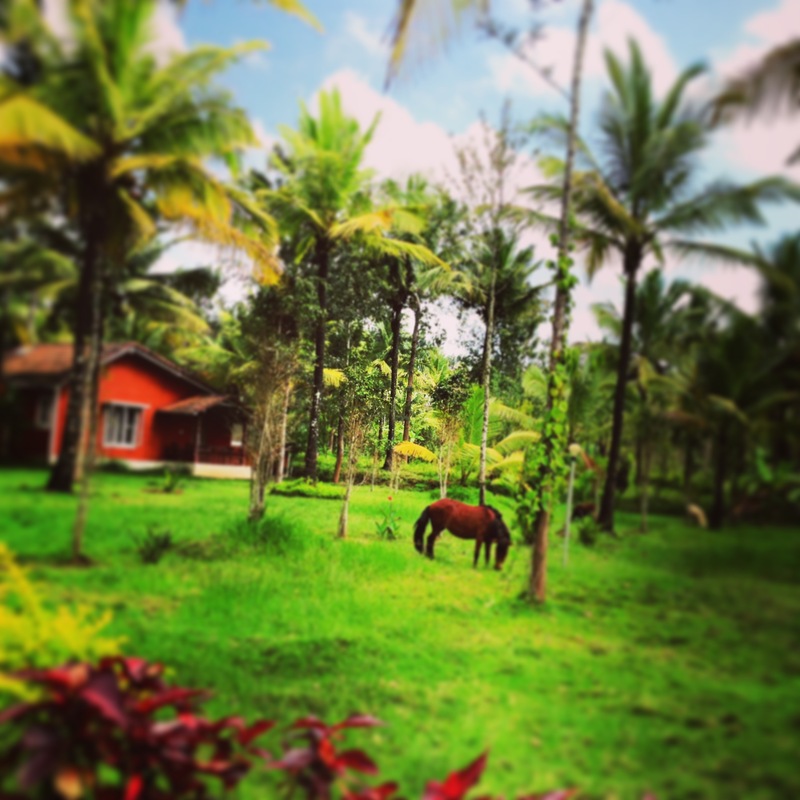 An Instagram Shot of the Eco Habitat Resort. 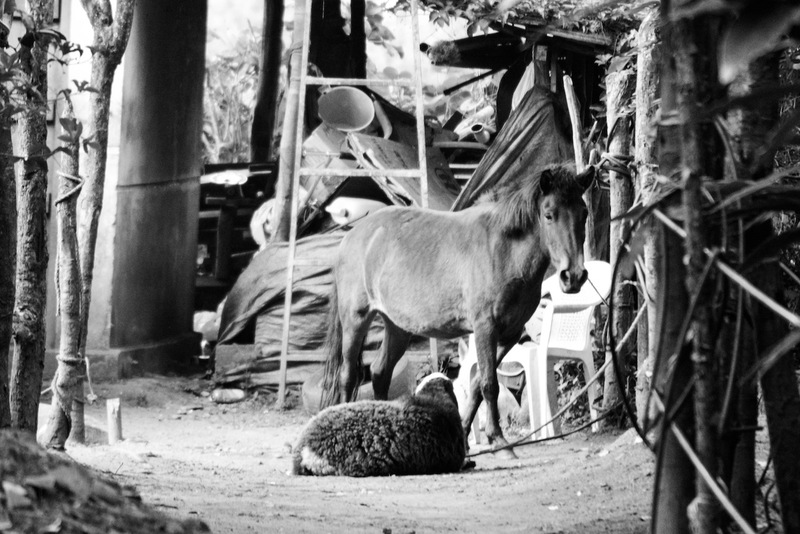 With the pony and a bunch of other animals, the Eco Habitat resort was far from the maddening crowd in city. Our gracious hosts, the husband wife duo of Som & Chetanwere so warm and friendly. 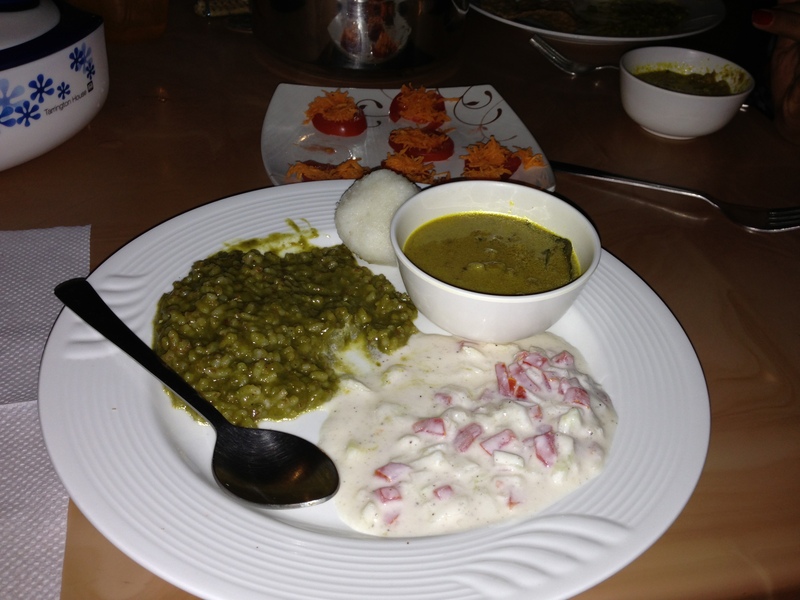 Chetna’s meals breakfast, lunch and dinner were delight and gave us a real glimpse of the South Indian delicacies. That’s dal, rice dumplings and curd for dinner. The heavy image exposure is for the flash used to compesnat for the night shot. 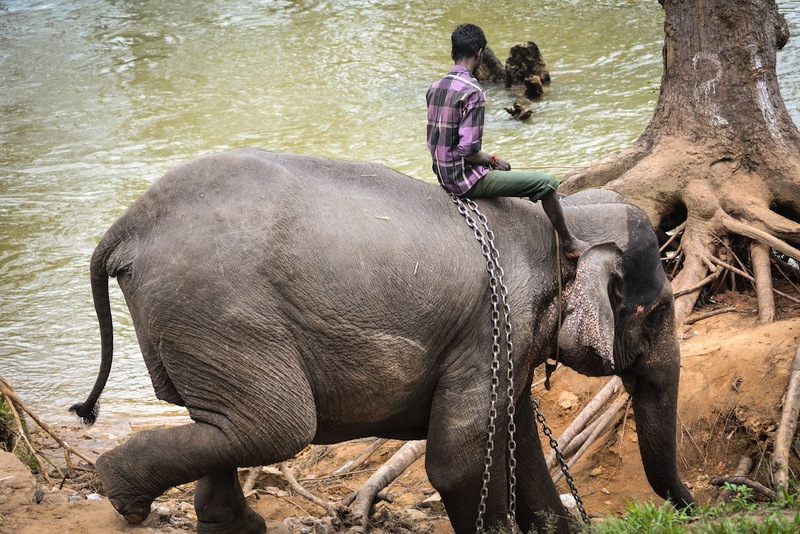 Dubare Elephant Camp near Kushalnagar is a good place to enjoy the good old elephant rides, elephant bathing and more. Across the river, you can also enjoy water rafting. We went to the Chiki Dam which is 3km off Kushalnagar. It offers picturesque spots and is a delight for the shutterbugs. 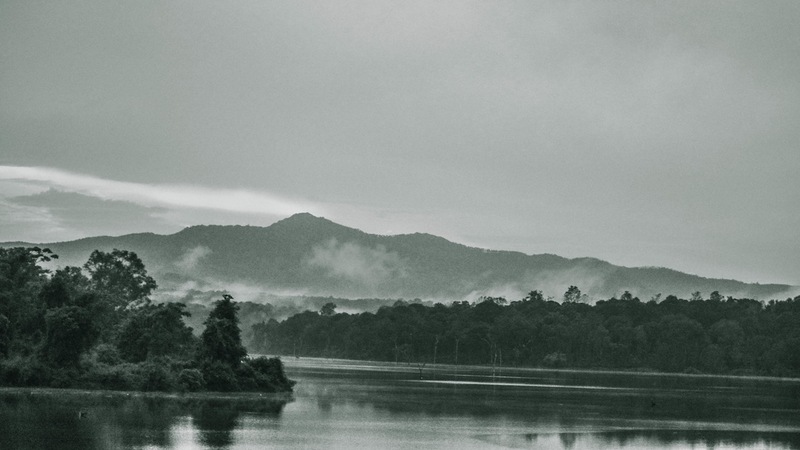 Here is another black and white shot of the mountains/river near the Chikli Dam. It’s a heaven in the evenings. 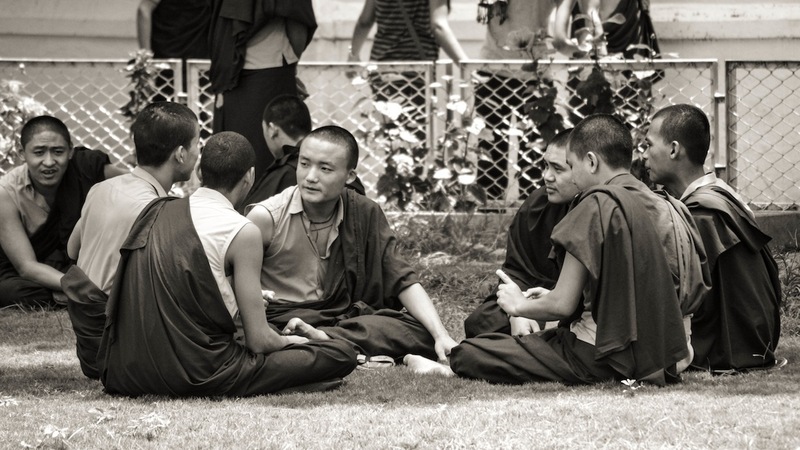 Located at about 30 minutes from the Eco Habitat, Bylakuppe is a Tibetan Refugee settlement, the magnificent Monastery in Kodagu state. 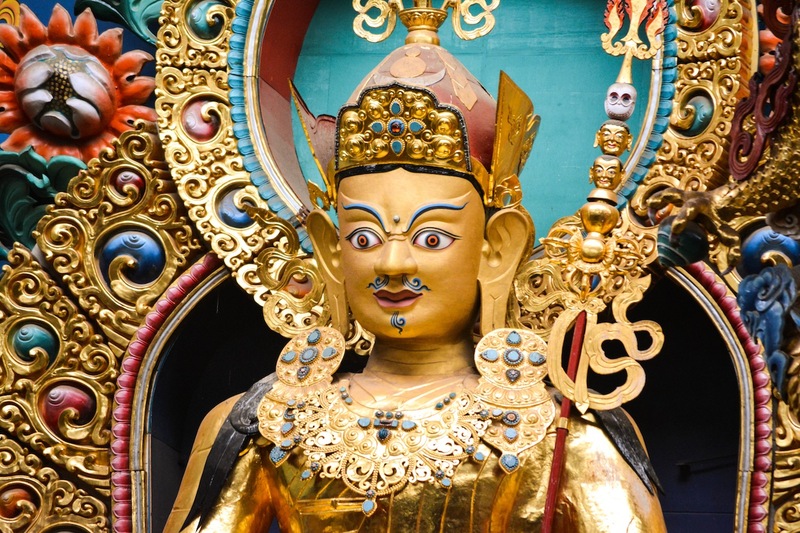 You would see Tibetan refugee monks, their families and the golden statues of Buddha and other gods across the Namdroling Monastery. 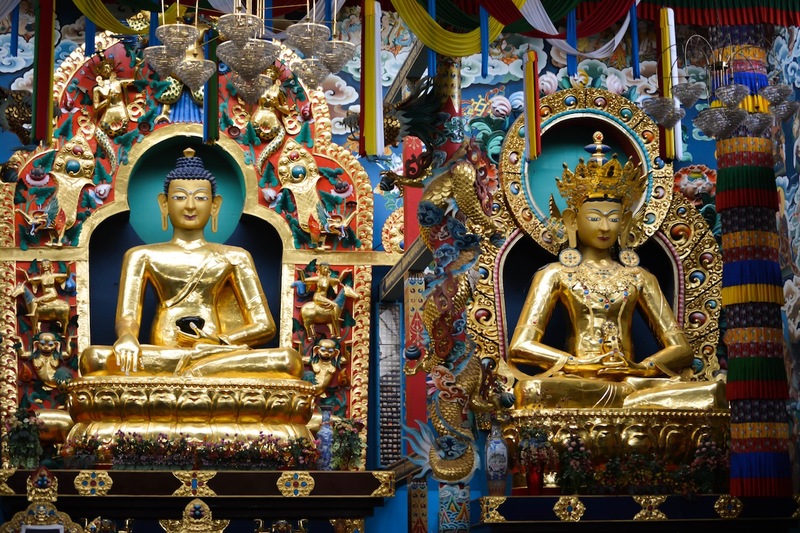 The Golden Statues of Buddha, Padmasambhava and the Buddha Amitayus. The picture shows 2 of the gods. 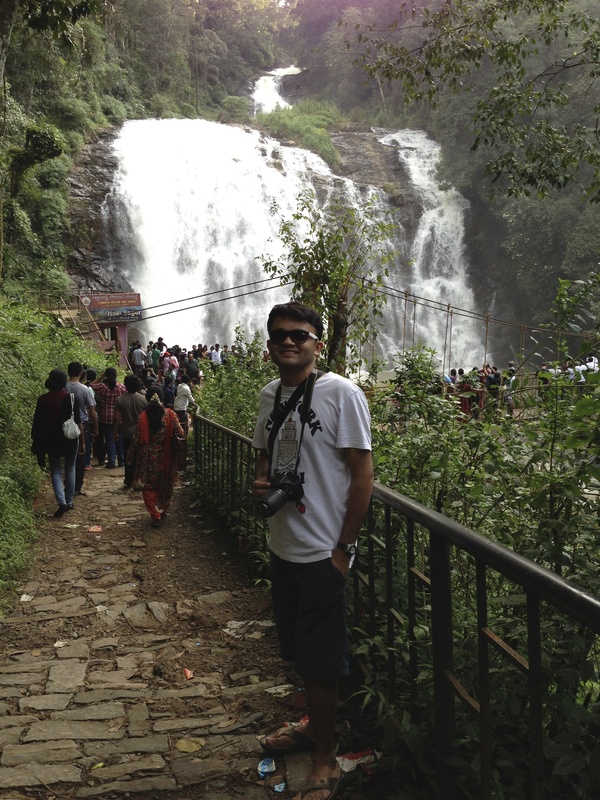 8km from Madikeri, Abbey Falls are in the mountains of Western Ghats. 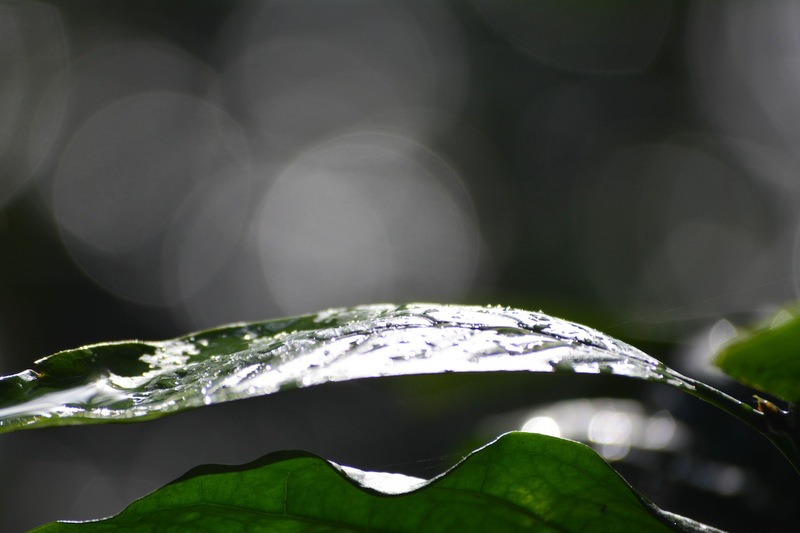 With lush green jungles & waterfalls all around, Coorg is a heaven for those who love trekking. 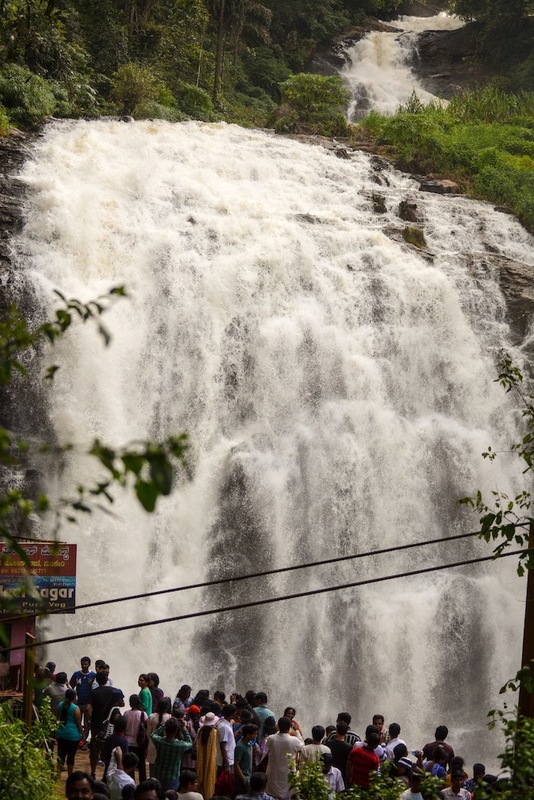 We trekked right after the monsoons and there were leeches who greeted us, but the breathtaking views and the scenic waterfalls didn’t dampen our spirit. Go for the Jodhpala jeep trek, 12km of Madikeri as we did with the help of local ex-army man, Ravi. 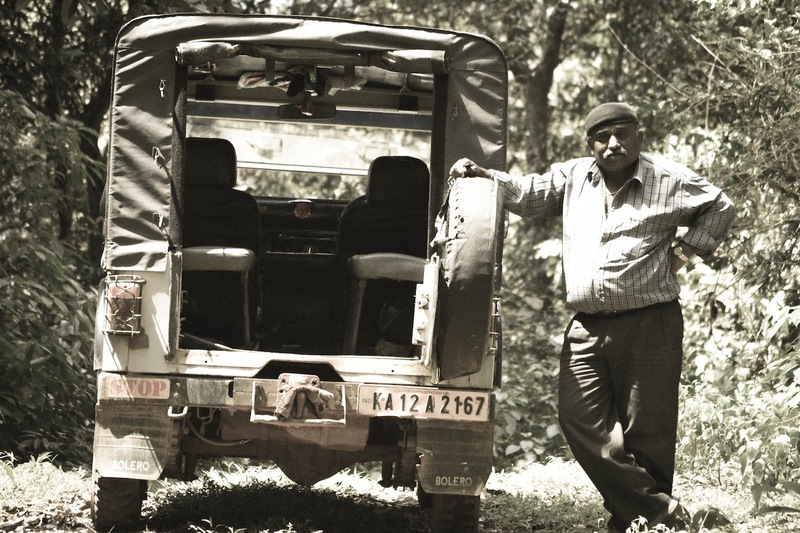 He took his 4 wheel drive Bolero in the narrow lanes of the jungle and made it an experience of a life time. On our way up the hill, we met a local family and were treated with limejuice and Upmas. That’s our man Ravi up the jungles with his 4 wheel drive, Bolero. He waited for us in the heart of Jungles as we came back from our trek in about 1.5 hours. 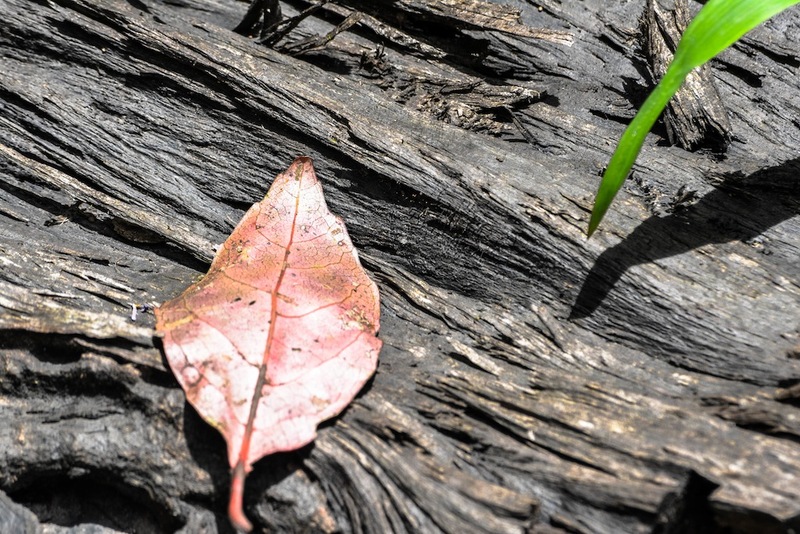 The jungled opened upto some pictersque views during our trek. It was a beautiful view of the western ghats, with rudraksha trees calling for the rains and waterfalls all around. I couldn’t resist taking a pause and clicking such heavenly views. Raja’s Seat (Seat of the King) is a seasonal garden of flowers and artificial fountains and was a favourite of the king during ancient times. 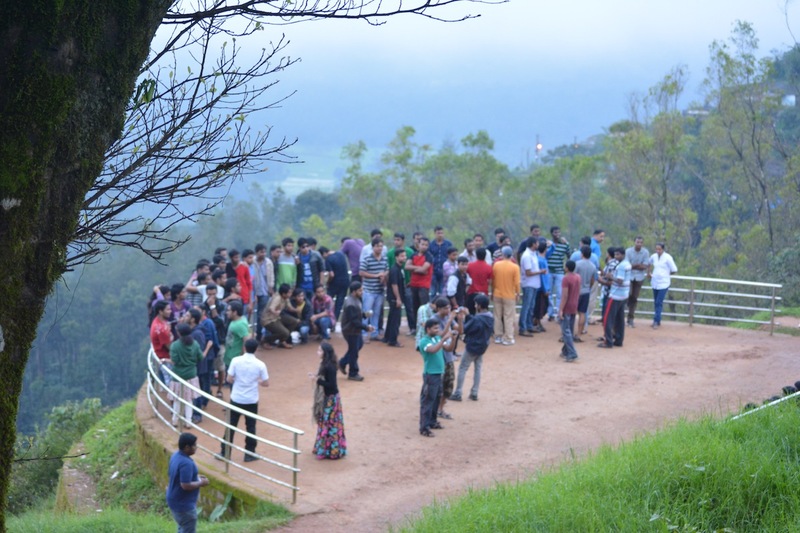 It is a popular tourist spot in Coorg and you would see large groups of youngsters out here at any time during the day. The garden offers breath-taking views of low rise mountains and you can spend hours here adoring the sunset. Unfortunately, I don’t know names of any of these flowers. If you do know any of these names, do share them via comments. 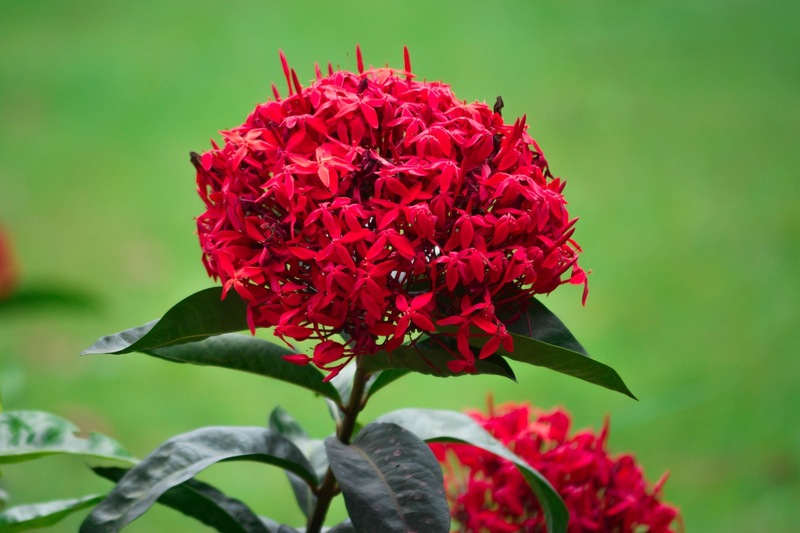 If you just want to relax, you can adore a variety of colourful and exotic flowers bloom in Coorg. Coorg is rich in flora and fauna with coffee plantations, pepper and cardamom plantations all around. This is what I did in Coorg 🙂 Came back from a wonderful vacation recently? 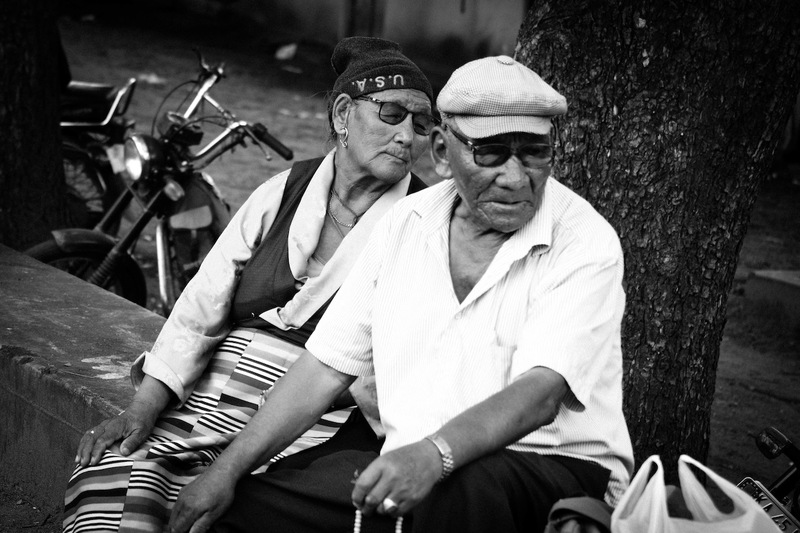 Do share your experience in comments while I pen down my next post on Mysore. Hey, What a wonderful post and pictures! It was very interesting reading your post. Precise and we’ll written. Thx. Will help plan my trip. I’m planning to escape to coorg with my girlfriend. Can you please let me know about how much each thing costed foe you? 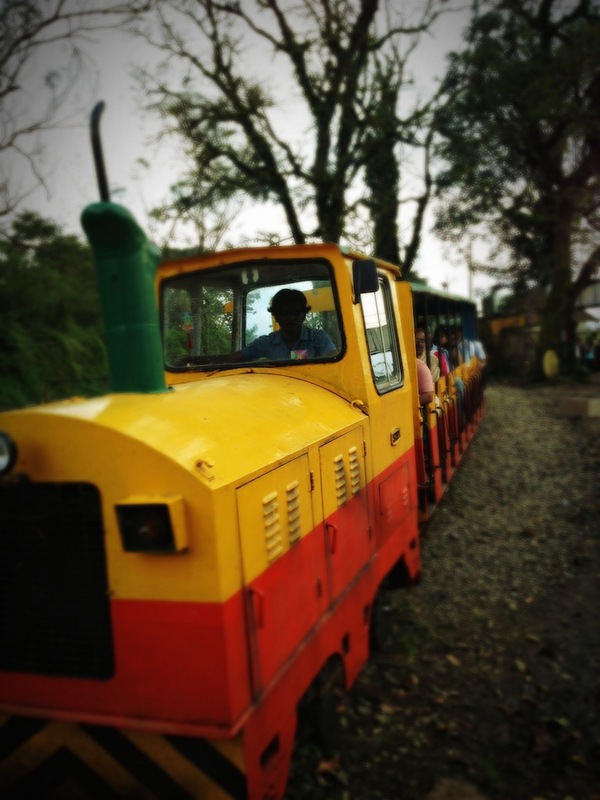 The stay, the cab, the trekking…. Seems part of the content taken from Lonely Planet site avoiding the reference. Hey…can I get contact details.for.ravi! trekking sounds most adventurous to me so i planned a trip to coorg that is pretty popular for its lush green forests and scenery and trust me it was breathtaking. not just forest, everything there surprises you with it exotic beauty. there are so many places to visit in coorg that you cant resist to visit. Hi, good place for honeymoon, good information provide on your i am planning for weekend vacation for coorg..
Our Homestays, Cottages, Bungalows in Coorg provides A Home away from your Home, with all the luxurious comforts and facilities, for whatever duration it takes, Experience and share the unique hospitality of the host family and the unique feeling imparted while staying in a home and interacting with people of a different culture and to make your trip a pleasant memorable experience. 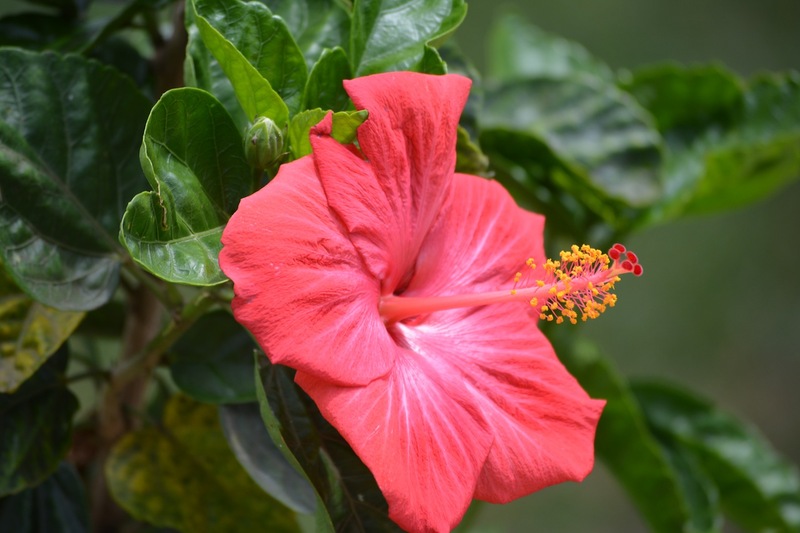 The natural, green, pollution free and quiet settings of homestays, bungalows, cottages in Coorgoffer guests a wonderful opportunity to relax or de-stress and enjoy the local cuisine. Which out of these is the ‘must not miss’ if one has just a day to spare. Something that’s not too touristy? good. we are planning to go coorg from 15-02-2015 to 17-02-2015. is 3 days sufficient? 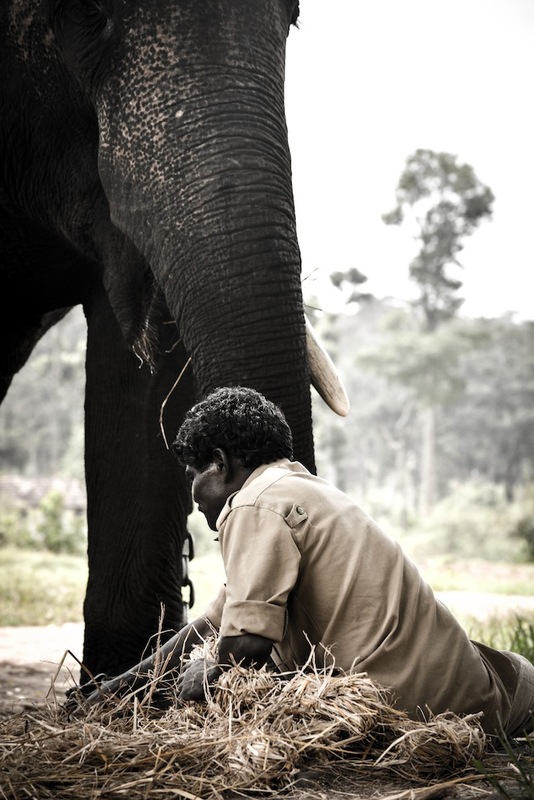 Hey nice write-up on Coorg with great imagery! 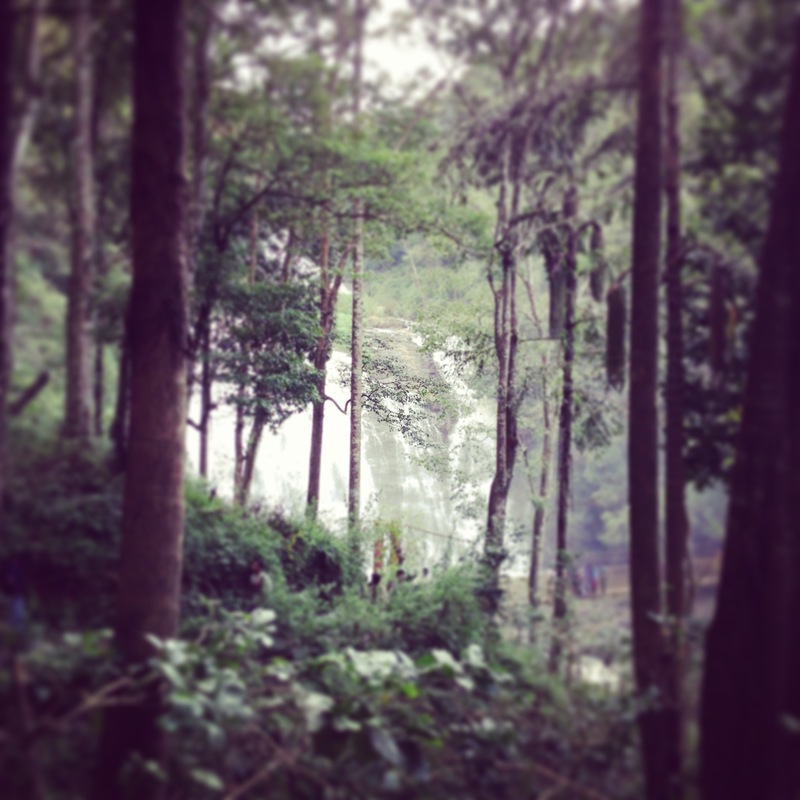 I have linked your article to my blogpost on Coorg! ;-) Cheers! Great places, every spot here is best for visit. there dozzens of attractions, i like trekking in Coorg, many places are awesome, if you really want to see the beauty of the place, just trek. i found information in Coorg.in is very informative.